New Zealand's Unknown Mortal Orchestra released their third (and highest-charting) full length album "Multi-Love" last summer and the group's first appearance in Kansas since then looked to be a great way to start off this summer. On a warm and breezy Thursday night as classes were finishing for the semester, nearly every young soul in Lawrence interested in independent rock made their way to The Bottleneck. The band emerged from the green room staircase to some of the loudest and most enthusiastic screaming and cheering I've heard in quite some time at a venue this size. 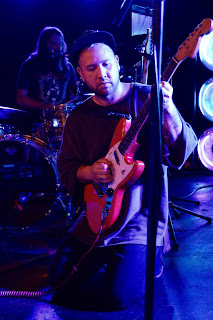 Vocalist and guitarist Ruban Nielson seemed visibly charmed by the crowd's excitement and chuckled a few times after hearing several dramatic cries from different women in attendance over the course of the set. He didn't waste much time talking to the crowd -- besides complimenting a girl's lipstick in the front row -- but nobody really minded. What the show lacked in chit-chat, it made up for twofold in showmanship. As songs would reach their climax or make a sudden shift, Nielson would twist around and quickly drop to his knees or ankles in a krump-like fashion before springing right back up. 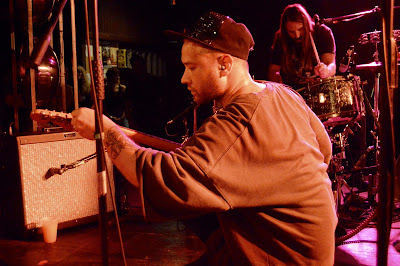 If you listen to run-of-the-mill indie or garage rock this might seem like odd behavior for a frontman, but if you're familiar at all with UMO you might understand. The quartet's effortless blending of garage, R&B, funk, and psych rock is almost impossible not to dance to. Several songs, especially the funkier "Multi-Love" tracks, spurred Fugazi-levels of white people grooving. While the entire set was made up of incredibly fun and rhythmic pop tunes, the band did offer a couple distinct highlights. One was the song "Ffunny Ffrends," the first song written by Nielson for the band that he released to an anonymous Bandcamp page back in 2010 shortly after the implosion of his former band The Mint Chicks. The song was not originally recorded with a keyboard part, so keyboard player Quincy McCrary went to town on it. Nielson ended the song in an audience clap-along as McCrary pounded away using a soulful Peanuts grand piano tone on an extended ending. "Stage Or Screen" included Nielson jumping down into the crowd as he sung for a minute. An awe-inspiring amount of teamwork was put into making sure the microphone cord did not get tangled as Nielson meandered across the floor. After playing nearly fifty minutes the band left the stage. The audience begged for an encore; several fans hopped up and down as they chanted. The boys reappeared a minute later for a round of shots and jumped back in. The rousing title track "Multi-Love," somber and soothing "Necessary Evil," and vibrant, disco-influenced millennial anthem "Can't Keep Checking My Phone" all pleased the still-grooving crowd. Every talented band deserves the appreciative, animated audience that UMO received on Thursday night, but then again, not every band is UMO. Unfortunately, opening act Whitney had to cancel the day of the show due to illness. They are one of the best new bands of 2016 and their album "Light Upon The Lake" is incredible. Excellent, soft, well-written, country-inspired pop. I hope they return to town soon. DJ CyrusD spun some records to make up for their absence. I would have suggested Kansas Citians Fullbloods to fill that gap, but I recognize that would be tough on less than a day's notice.